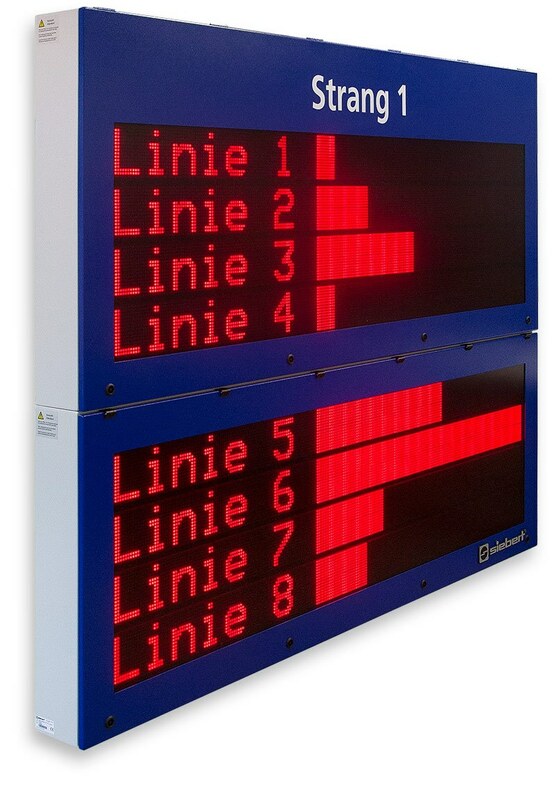 Presentation of information over long distances, visualization of process data, operator guidance in plain language - these are typical applications for the alphanumeric large size displays of the SX502 series. A wide range of types with character heights from 33 up to 120 mm is available, from compact two-lined versions up to large-scale boards. Technical perfection and innovative details are features of the SX502 series. 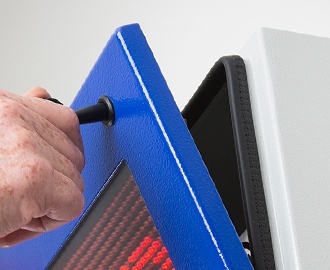 The large size displays are off ered either with a one- or a doublesided display. 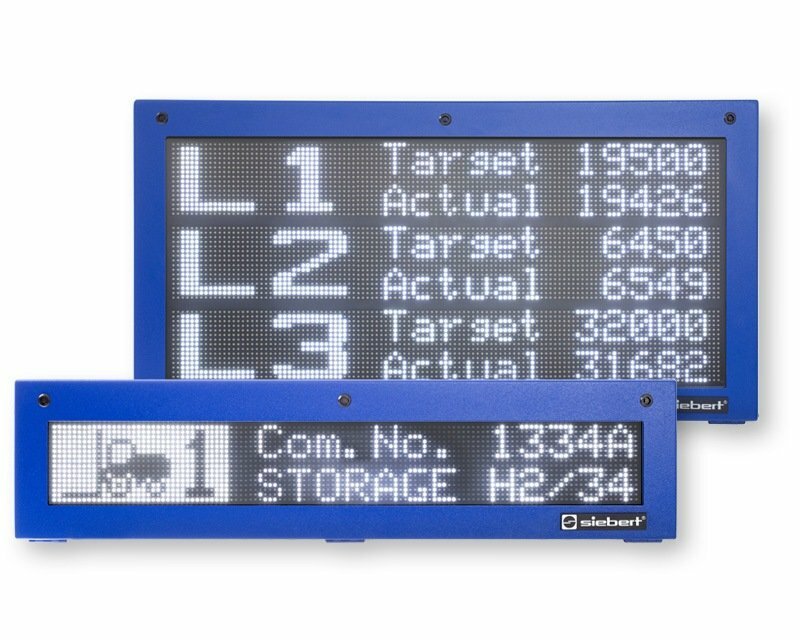 The versions with a double-sided display have a LED matrix on the front and on the rear side and show the same information on both sides. After opening the housing the menu display is visible inside the device. 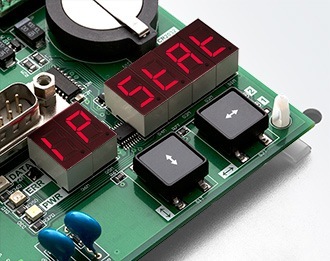 Operation modes, parameters and device functions are defi ned without the need of the main display to be visible – an operational convenience especially with large volume devices or at exposed installation sites. The front frame is locked with quick-action releases. 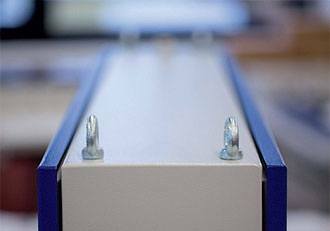 When opening the unit the front frame hinges downward. Connectors, modules and controls are now directly accessible without disassembling housing parts. 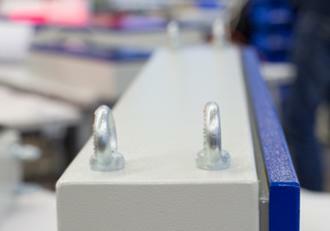 For large devices the front frame swings upward and is held by pneumatic springs. The large size displays support the interfaces for the industrial communication: fi eld buses, network topologies, serial control, etc. The devices are equipped with PLC-compatible function inputs. They allow the activation of device functions such as fl ashing, blanking and reduction of the LED brightness (day/night mode) independent from the signals over the data interface. In this operating mode several texts independently of one another, e.g. from diff erent data sources, can be assigned to individual lines. Each line is considered as a stand-alone display and is selectively controlled. 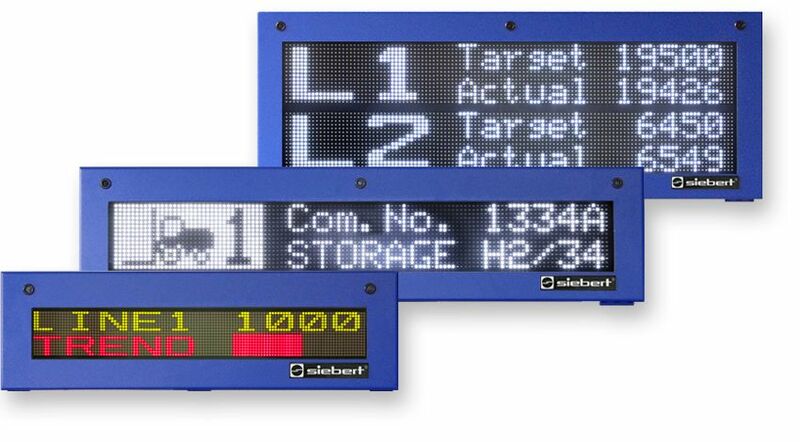 This operation mode is advantageous if the large size display as central master board shows cross-process information generated from diff erent process areas. Fixed texts are defi ned with an address in the internal text memory. Upon receipt of an address the corresponding text appears in the display. This operating mode is advantageous if recurring texts are displayed. Variable information such as current measured values, quantities or time and date can be displayed in the texts. A fixed text can also be used as initial text at power-on, e.g. ”System trouble-free“. Character sets with diff erent attributes are installed in the devices. The character heights are 7, 14 or 16 pixels. The pixel grid of the LED matrix is (depending on the unit version) 4.7 or 7.6 mm.